GB Precision has added centreless grinding to its machining capabilities, with the purchase of a Unison Dedtru 388. This machine can grind to micron tolerances and offers specific capabilities, particularly when it comes to achieving the best roundness, dimensional tolerance and surface finish for small, delicate or very slender parts. The main benefit of centreless grinding is its ability to produce excellent roundness with extremely close diametrical tolerances and excellent surface finish in many different materials, including ceramics, fibreglass, tungsten and Teflon as well as hardened tool steels. 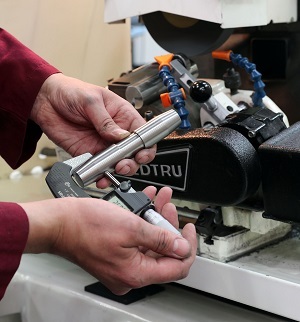 Additional advantages include the fact that, because workpieces are supported directly beneath the grinding cut, and along the length of the item, there is little work deflection, enabling long, slender components to be accurately ground. A wide range of components from many industry sectors are suitable for centreless grinding, including bushings, carbide rods, rollers, cylinders, pins, pivots, spools, tubes and valve components. Although centreless grinding is often associated with mass production applications, the process offers real benefits for GB Precision’s customers in the production of short run, specialist components, which may be small, or delicate and liable to deform. To take one recent example of work carried out on the Dedtru, GB Precision has just machined a set of very small rings, which were found to have become slightly distorted when they returned from the heat treatment process. If these had been reground using standard equipment the pressure of the jig itself would have added further distortion. By using the centreless grinder, the external diameter could be reground with no distortion. © Copyright GB Precision 2017, all rights reserved.